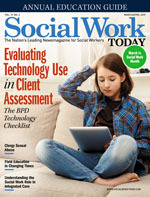 A new tool helps social workers understand client technology use as an essential part of what clinicians need to know. Decades of hidden sexual abuse have ignited outrage at the clergy perpetrators, but will this last after the scandals fade, in a new era of awareness of the pain of survivors? Cultural and professional trends in a digital society are reflected in innovative field education programs and projects. As interprofessional collaboration grows, social workers must ensure they have a place at the table and are able to explain and advocate for their role. 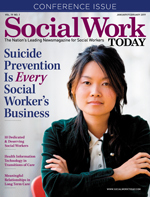 Social workers don't need to specialize in suicide prevention to screen clients for risk and warning signals, but they must be prepared. Social work education must step up to better train students for this aspect of practice. Communication in transitioning patients from one care setting to another is invaluable, and health information technology is making that more efficient and effective. A qualitative study of long term care residents shows cultivating meaningful relationships between residents and between staff and residents may be one of the most important ways to help them feel at home in long term care. Each year Social Work Today recognizes 10 social workers nominated by their colleagues for outstanding service. Peer-Based Recovery Support Specialists — Is a New Direction Needed?